The prehistoric arthropods of the land are Myriapoda (“countless feet”): a gigantic millipede, Arthropleura; a millipede relative, a pauropod; and a predatory centipede. Myriapods were the first land animals. They breathed air in and out through spiracles, which are holes in their exoskeletons. 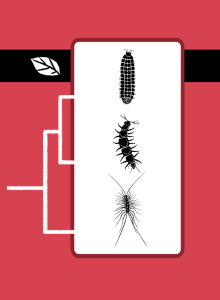 Early myriapods ate rotting plants. Like pancrustaceans, the myriapods had mandibles that were good for chewing food. Millipedes (“thousand feet”) appeared over 400 million years ago, and their body segments were “doubled”, so they had two pairs of limbs per segment. Arthropleura (“jointed ribs”) lived 300 Mya, before the Permian extinction. The biggest Arthropleura were over 2 meters long, as big as the big eurypterids, and the biggest land arthropods ever. On the other hand, Pauropoda (“few feet”) are tiny, and scientists have found no fossil traces of them. They evidently split from the millipedes over 400 million years ago. Centipedes (“hundred feet”) split off even earlier. Unlike their immediate ancestors, centipedes were predators. Their two front legs no longer helped them walk but instead formed pincer-like venomous stingers called forcipules. It’s a sting, not a bite, because forcipules are limbs, not mouthparts. The centipede clade is called Chilopoda (“thousand feet”), and the millipede clade is called Diplopoda (“double feet”).